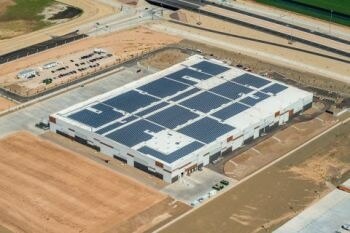 REI, a national specialty outdoor retailer and the nation’s largest consumer co-op, has announced the completion of a 2.2 MW rooftop solar installation atop its new distribution center in Goodyear, Ariz. This is REI’s third distribution center, and will improve customer service and delivery response across the Southwest region. As a company with a deep-rooted history in sustainability, REI’s latest solar system will offset 100 percent of the facility’s annual electricity consumption, helping the company reach its goal of achieving a net zero operation. To get this expansive project off the ground and help REI fulfill its commitment to environmental stewardship, collaboration was vital. Capitalizing on the strength of an eight-year history with Blue Oak Energy, the companies leveraged their longstanding relationship to create this project that brought REI’s solar portfolio to 5.4 MW – more than double what it had previously been. Working hand-in-hand with REI, the Blue Oak team was there at the very beginning to help conceptualize the building and construction plans. The group was intimately involved in every aspect of the project, selecting the materials and components that fit the company’s vision and values. Each item was carefully chosen to maximize return for REI’s co-op members – an area of critical importance for the company. Working with the comprehensive, end-to-end solar team at Blue Oak Energy, the solar facility was designed to generate high performance and return on investment.